Oglebay Park’s Winter Festival of Lights takes visitors on a 6-mile driving tour, sparkling with more than 90 displays, including Snoopy and his gang, poinsettias, Cinderella’s castle and so much more. 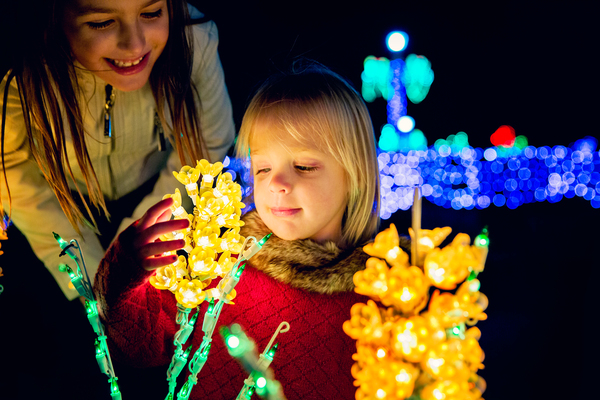 With over 100 million lights, it is West Virginia’s largest holiday light show. The Winter Festival of Lights has received numerous awards and honors in its more than 30-year history, such as a spot on the American Bus Association’s Top 100 Events in North America and AOL Travel’s 10 Best Christmas Light Displays in the U.S. In its first few years, the Festival of Lights stretched just two miles in length. In a sense, it attempted to mimic the long-standing tradition of families driving through their neighborhoods to see the houses festooned in twinkling Christmas lights. But it was so much more than that. The light sculptures stood out sharply against the dark, rolling hills of Oglebay Park, which created a sense of merriment throughout the car, packed full of family and friends. Soon, Oglebay was packed with visitors from across the country, who came by car and tour bus to travel through the light display, enjoy a holiday buffet at Wilson Lodge and pick up some Christmas gifts in one of the many shops throughout the park. By its second year of operation (1986), the Winter Festival of Lights brought in thousands of visitors, and the park played host to more than 600 tour buses. Although tour buses are no longer as popular as they once were, it is not uncommon to see a train of taillights snaking its way up W.Va. 88 on winter nights. Like all things at Oglebay, the park continues to outdo itself and has made the Winter Festival of Lights the best it has ever been. This year, my 7-year old son and I were amazed at how much it has grown in both new light sculptures and fun activities. Gone are the days when visitors sat idly in a slow-moving stream of traffic besieged by tour buses. Instead, Winter Festival of Lights visitors are welcomed to get out of their cars and enjoy unique family entertainment and shopping along the way. Although the Winter Festival of Lights tour is free, we always make a donation, knowing that more than half of the expenses of the light show comes from donations. After making a one-time $25 donation at the gate near the Schrader Environmental Education Center, we were given our pass, which is good for the entire season, and four pairs of 3D glasses that truly made viewing the lights even more spectacular. Each pair of glasses added special effects to the lights. One pair made the lights look like fireworks. Another pair made them all appear as snowflakes. A third pair made them look like stars. My favorite pair of all made reindeer faces out of Christmas bulbs and headlights. Although they can’t be worn while driving, ample opportunities to slow down and slide them on presented themselves throughout the more than 300-acre drive. My son and I stopped at several fun venues as we meandered through the light displays. We stopped for a holiday train ride at the winter carnival at Levenson Shelter. (Adults can ride, too!) We scooted around the little track through the Christmas tree forest, oohing and ahhing over the inflatable minions and other fun décor around the loop. After we deboarded, we ordered two hot cocoas at the concession stand and warmed our hands by the fire pit near the forest of trees outside the shelter. We hopped back in the car and made a short trip down to the Good Zoo. As zoo members, we enjoyed free admission to one of the best holiday light shows in the Ohio Valley as the back wall of the zoo was draped with many-colored lights that blinked in time with some of our favorite holiday songs. Afterward, we headed back inside to see the red pandas mosey through their indoor home, stopped to take a goofy picture at the alligator’s habitat and watched the armadillo scurry around his quarters looking for snacks. Before resuming our adventure, we stopped at the zoo concession stand for popcorn and water for the rest of our journey. We followed the lights up to the Oglebay Institute Mansion Museum, where we marveled at how spectacular each room was decorated by professional and amateur local designers. Although it is hard for us to pick a favorite from the 13 rooms and hallways trimmed with the decorators’ own visions, the Federal Bedroom by Yvonne Jacobs of Collectors’ Cottage is impeccably decked in classic holiday favorites. Sponsored by Panhandle Cleaning and Restoration, this year’s event is titled “Holiday Magic.” Some designs are simple and elegant, and others are extravagant and whimsical. Holidays at the Mansion is open 10 a.m. to 5 p.m. Sunday through Thursday and 10 a.m. to 10 p.m. Friday and Saturday, through Dec. 31. The Mansion is closed Christmas Day and New Year’s Day. We walked back through Bissonnette Gardens, lit with 150 twinkling hanging baskets and thousands of lighted flowers and trees, to stop at the Nativity scene. After waving goodbye to baby Jesus, we decided to warm up in the Farmhouse Sweets and Treats Shoppe. We bought some Oglebay ornaments for our tree, a few gifts for special people in our lives and a couple of delicious honey-sweetened candy canes. We then walked a few feet down to the Glass Museum Gift Shop, where we found beautiful glass sculptures and ornaments. We were surprised to see that a small café had been added to the gift shop, and we stopped to smell the freshly made coffee and ogle at the sweets behind the counter. But we weren’t done yet. Candy canes in hand, we got back in the car and cruised by the toy soldiers display near Speidel Golf Shop. My favorite of all the light displays in that part of the drive is Santa in his sleigh. My son liked the sled riders crashing into a ball of snow. We both like the big stack of presents in honor of Oglebay Park’s 90th birthday. Our very last stop was for a tour of Wilson Lodge. We knew that Hickman Lounge would be decked out in its Christmas finery, and it more than lived up to our expectations. Recent renovations of the lounge gives it a cozier feeling, and we stayed for a bit to listen to Marcus and James perform a few songs. Nightly entertainment and refreshments are available in Hickman Lounge from 7-10 p.m. In all, we spent over three hours enjoying a truly magical evening at Oglebay’s Winter Festival of Lights. It is not just a driving tour — it is truly a family experience. In fact, there was so much to do that we will need a few more trips to take it all in. Make a visit to the Festival of Lights part of your family’s holiday this year and in years to come. Don’t feel like driving? Trolley tours are available several times each night beginning at Wilson Lodge. Put on your Sleigh Bans and enjoy the show. The Winter Festival of Lights is open Sunday through Thursday until 10 p.m. and Friday and Saturday until 11 p.m., now through New Year’s Day. Additional 3-D glasses can be purchased for $1.99 a pair at Sarita’s Coffee Shop in Wilson Lodge, The West Spa at Wilson Lodge, Oglebay Good Zoo, the NEW Winter Carnival at Levenson Shelter and other retail locations throughout the park.